There are many different types of bereavement, the losses that we feel grief over are more than just when people we care about die. Sometimes people leave us. This can be family, for example when a parent or sibling leaves the family home we can be left feeling abandoned. Our friendship groups may break apart, this is very noticeable in school but it can happen at any age. We may separate with romantic partners and feel a great lose due to that. 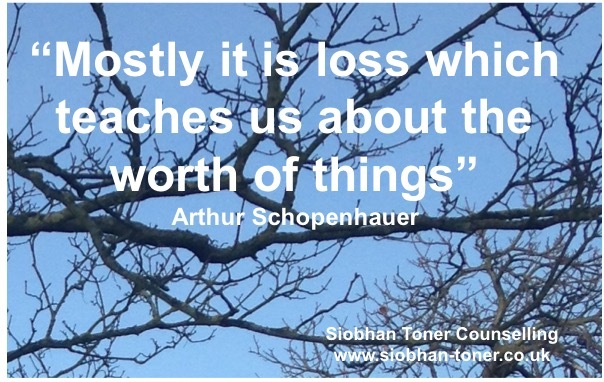 Other types of loses can also be incredibly hard to cope with. The loss of a home – this can be due to poverty, breakdown of relationships or a secondary bereavement when a loved one dies. The loss of innocence can be very traumatic if it comes through abuse. This can also link to being a victim of other types of crimes like a mugging or burglary, where we can loose a sense of safety in our surrounding. The loss of a job through redundancy can be very upsetting as it can challenge our sense of self, our purpose in the world and our self esteem. The loss of health, having to adjust to a future without the health we may have taken for granted up to then. All these are examples of loss and bereavement, all these losses can have long term psychological impacts and we may grieve for what has been lost or the future we thought we were going to have. What losses have you experienced? Next Post Am I the right counsellor for you?